Washing machines are heavy. This is due to concrete blocks inside. If the drum wasn’t weighted down it would bang violently from side to side, and try to burst up through the lid during spin. Modern washing machines usually have 2 drum weights inside. One on top of the drum, and one either underneath or around the front of the drum. I’ve just seen an article on the BBC News website about a new idea to replace concrete weights with plastic containers that can be filled with water. The idea involves replacing the concrete weights with empty plastic containers. The weight would be returned to the washing machine by filling them up with water once delivered to the customer. This would make washing machines up to a third lighter during transport. They estimate it could save around 44,625 tonnes of carbon dioxide emissions a year as well as saving millions on fuel. It sounds like a simple and clever idea. I like the concept. I also love the idea of people thinking of ways to improve things from outside an industry. However, I’m not sure how they will be able to make it work. Could plastic devices filled with water replace the concrete weights? According to the article, drum weights in a washing machine typically weigh around 25Kg (just under 4 stone). So getting rid of this weight is genius apart from one major problem – water isn’t as heavy as concrete. The replacement blocks would have to be a fair bit bigger, but washing machines have never been so short of space inside. A litre of water weighs 1 Kg. A typical washing machine would need up to 25 litres of water adding to equal the weight of previous concrete blocks. 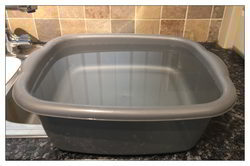 The picture shows my washing up bowl full of water. I measured out 10 Litres of water so it should weigh 10 Kg. Therefore a washing machine with 25 kg of weights inside would need weights capable of holding the equivalent of two and a half washing up bowls of water. Larger capacity drums have forced manufacturers to increase the size of the outer drum. It’s already probably too close to the cabinet and other parts. There needs to be adequate room between the outer tub and other parts as well as the sides of the casing and the lid. These drums can bounce and bang around violently on spin and cause damage. They can’t increase the size of the cabinet to accommodate larger weights. So there’s no spare room. If the savings in carbon dioxide emissions and fuel were overwhelmingly desirable then appliance manufacturers might find a way to make it work. I think major redesigns would be needed. The outer drum could be double skinned to take some of the water. I also think the hollow weights would need to be part of the outer drum’s mould. Attaching plastic boxes to it would be fraught with danger of them coming loose. 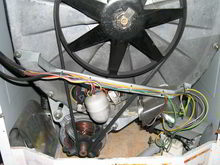 Up until roughly 25 years ago washing machines all had outer drums made of metal. They also had big aluminium back plates (see pic) holding the bearings. These parts weighed a decent amount on their own so they only needed a relatively small tub weight underneath. It’s only since manufacturers changed to a plastic outer drum that extra weights have been needed. Plastic drums are so much lighter than the old metal parts that they now need multiple weights. Ironically this idea would have been very workable back then because washing machines had plenty of space inside. But the weight savings would be too little to bother with because they only had one weight. Some space is also needed for the polystyrene packaging inside many washing machines. There may be no space left for transit packaging if the extra large plastic weights are fitted. Because of all the extra drying components in a washer dryer there is even less space available. It would be even harder to fit larger drum weights in washer dryers. 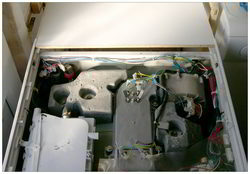 See the picture to get an idea how crammed a typical washer dryer is inside. If manufacturers were only able to fit the new weights in washing machines, and needed separate manufacturing processes for washer dryers, it would dramatically increase costs of washer dryers. Is it practical to fill the weights with water at point of delivery? Even if manufacturers managed to fit the larger blocks inside there is another potential downside. It will complicate installation at the customer’s home. Extra costs will be incurred by customers paying to have one installed. Extra complications and effort will be involved for diy installations. It will be difficult adding water to plastic weights underneath the drum. It would just be too inaccessible. So the new blocks would have to be fitted around the front of the drum (as well as on the top). They could both then be accessible for adding water with the lid removed. I’d also be concerned about a customer or installer spilling water when filling them. What if water spilled inside onto electrical parts? If not fully filled – could water move around inside causing shifting weight issues? The devices would need to be leak-proof too. If one leaked it could flood the machine with water causing potential fires, or catastrophic damage. Lots of centrifugal forces are involved during spin trying to shake off drum weights. The current concrete ones are always coming loose and breaking as a result. If one of the water filled weights came loose the plastic could soon wear through and water would leak everywhere – a disaster. The only sensible option would be for any fillable weights to be part of the drum’s mould and not bolted on. It’s a clever idea, but unless washing machine manufacturers radically redesign their machines to allow space for larger weights I can’t see them fitting inside. Also the practicalities of filling them up with water when delivered to the customer and potential disastrous water leakage into the machine if they leaked mean I struggle to see how it could be made to work. The “tanks” that are to be filled with water could have a reactive compound inside that absorbs the water and then sets hard thereby avoiding the chance of leaks.I seem to remember such a system being described to me a few years ago but at the moment i can’t recall what the aplication was used for. The concrete weight is used for damping, but I can also recall years ago with smaller metal drums that they still required two and occasionally three concrete block to absorb the energy. However there maybe a way of reducing some of these blocks weights by using a combination of a shock absorber, similar to those used on vehicles and on some industrial equipment, and a concrete weight. There is also the fact with water that unless the container was completely full then the water sloshing around could exacerbate the problem. (Road tankers have dividers inside the tank to prevent liquids sloshing around, besides making the vehicle uncontrollable but also can tip it over.) There is also the fact that if in a cold area in certain parts of the country, and particularly more northern parts of the world, the water could freeze and rapture the container. Some form of antifreeze would be required that is likely to be toxic. The whole thing gets messy, from filling and installation perspectives as well as from possible leaks. Maybe the answer is a quick setting concrete mixture contained within containment that water is added to and allowed to cure. This would get over the transit and locating the machine problem with weight, but does not get over the issue of lack of room within the machine’s casing. Yes Bob, that’s an interesting possible solution to the leak concern. Hello Geoff. The Hoover washing machines I specialised in (and used for one of the photos) had just one tub weight hung at the bottom of the metal tub. That weight combined with the metal outer drum (tub) and the aluminium backplate was enough to keep the machines steady. Some brands might have chosen to have smaller weights distributed around the tub. Many washing machines also had big cast iron spiders with bearings in attached to the back of the tub that were as heavy as a drum weight. Since they all moved onto plastic outer drums they all need a lot more weights. If the shock absorbers could be good enough to dampen virtually all outer drum movement then they could have the outer drum and weights closer to other parts and the casing. However, that would also increase costs. The whole idea could end up adding quite a lot to the cost of a washing machine because of all the redesign and installation costs. The only way I can see it taking off is if the government really needs it to happen to offset carbon emissions. Then increases in costs to consumers becomes collateral damage so to speak. I also mention the moving water problem in my article although I only give it one sentence. The freezing water issue is one I hadn’t thought of. Many washing machines are kept in garages or out buildings. It would need to get pretty cold to freeze water inside the blocks but it’s not impossible and it would potentially be a problem if it cracked the blocks. The CO2 from transport is, essentially, a one-off that happens once per new machine. The CO2 from producing the concrete block is also a one-off, unless the concrete block breaks. I think a good solution to the problem is to use a weight that doesn’t break, can be recycled or even re-used, and a washing machine that lasts longer, thus meaning the environmental impact takes place one per 15 or 20 years instead of once every 4 years. Perhaps the weights could be made of cast iron and the machine built to last a couple of decades, as some manufacturers are already doing. This water weight idea sounds like a ‘solution’ to a non-problem. Probably water weights will be even less reliable than concrete weights, which in turn were less reliable than the iron weights they have largely replaced. Indeed Riccardo. If all washing machines were only made as well as Miele it would reduce far more carbon emissions than this weight replacement idea. Hello Liz. Unfortunately all washing machines will have problems on a suspended wooden floor. Miele are without doubt the least likely washing machines to shake about but even they are not designed or recommended to be used on a suspended wooden floor. It’s even possible (ironically) that with the Miele being so heavy it could cause even more vibration. Washing machines need to be on a solid well supported floor.